The Latrine Fair displaying various latrine models making it easy for people to choose the most suitable type for their families. An Giang, 03 September 2015- In spite of the mid-day summer heat, Dam Thi Lien wanders around the “Latrine Fair” exploring different types of latrine models. Here, she can see all the components of a real latrine – the underground layout, the pit, and the flooring which gives her much better idea of how a latrine is constructed as well as how much it would cost. 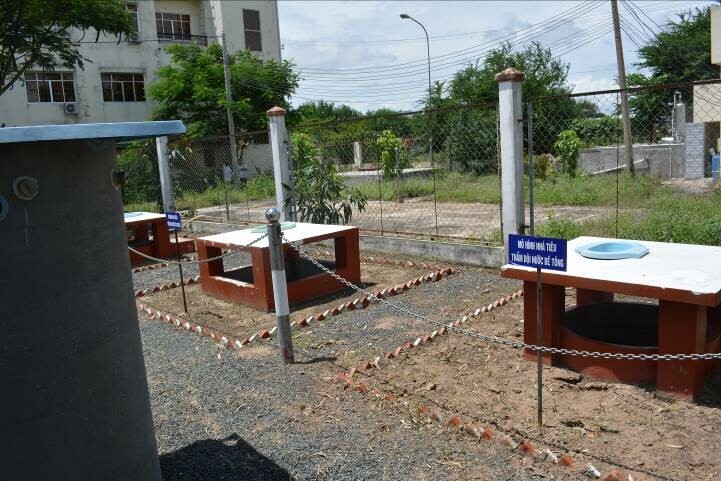 Supported by UNICEF Viet Nam, the Latrine Fair is part of the sanitation marketing activities in An Giang province in Viet Nam’s Mekong River Delta region. The latrine models are geographically appropriate and locally produced. Most are available at low-cost making them affordable to most of the people in the area. “This is such a good idea. It helps people in making up their mind on which type of latrine that suits them the most, both technically and financially. I wish we had a similar display area in my province”, said Ms. Lien who is the Deputy Director of the Health Department of Lao Cai province in the Northern mountainous area of Viet Nam. Together with other senior leaders and experts of Lao Cai, Ms. Lien is visiting An Giang to exchange experiences and learn good practices for programmes that help vulnerable and poor children. UNICEF has played a critical role in convening relevant stakeholders and facilitating exchanges of best practices on how to ensure children have access to basic services, building on local evidence and exchange of experiences. Considered as inter-country version of South-South cooperation, UNICEF provincial partners from Lao Cai and An Giang are laying the foundation for the beginning of a possible trend of exchange opportunities, bringing to light good practices and lesson learned on how to help Viet Nam’s most vulnerable children access basic health, education and social protection services that will help them grow to their full potential. “As Viet Nam is now a middle-income country, it is important that domestic resources be relied upon for sustainability reasons. We will continue to support the Government in capacity building, evidence generation, policy formulation and advocacy”, said Mr. Youssouf Abdel-Jelil, UNICEF Viet Nam Representative. 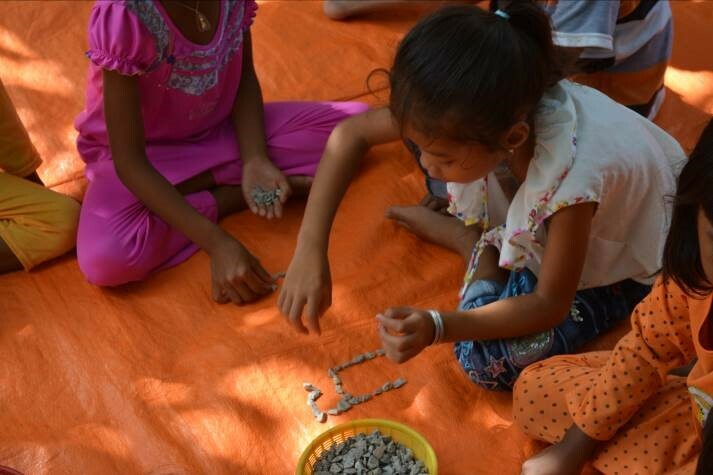 An Giang is one of the eight provinces where UNICEF supports the Provincial Child Friendly Programme. The programme provides a package of integrated services for children in health, education, sanitation, and social protection and helps to develop the capacity of provincial, regional and commune authorities to tackle issues that prevent children from accessing basic services. “We initiated the Child Friendly Programme in 2012 while An Giang joined in 2006 and has already achieved great progress in some areas. This is an opportunity to learn from them so that we can avoid unnecessary mistakes and accelerate our progress more effectively”, said Ms. Nguyen Thi Kim Ngan, Deputy Director of Lao Cai Planning and Investment Department. An Giang has made great progress in sanitation coverage, especially in the districts that UNICEF supports Community Approaches to Total Sanitation (CATS). Those districts have witnessed an annual increase of hygienic latrines by 10 per cent compared to 5 percent average of the province. Thirty communes were certified as Open Defecation Free (ODF) communities. “It would be difficult to keep track of the progress with normal monitoring methodology. Instead, we carried out mapping of latrines in the project districts. Based on the mapping, we knew who need to build the latrines and used the appropriate channels to reach them”, said Mr. Pham Hong Dung of An Giang Preventive Medicine Centre. Another success model was the Community-based Child Protection system (CBCPS), which UNICEF introduced in An Giang in 2008. To date, the CBCPS has been in operation in 56 communes, out of which, 41 communes are funded by the State budget. Lao Cai brought to the table their experiences in bilingual education. With a 65 per cent ethnic minority population, Lao Cai participated in UNICEF’s supported Action Research Mother-tongue based Bilingual Education in 2008. Since 2013, the Programme has expanded to children of the Mong ethnic group by the local authorities.